Babies get a virtual toe hug from the world's cuddliest creature. When it comes to lounging and looking cute, there's only one cuter creature than a sloth: Your little one. 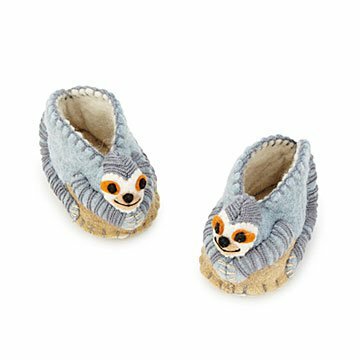 Keep their miniature feet cozy during sleep or play time with these adorable sloth booties. Handmade from local sheep's wool in Kyrgzstan by Gulnara Kydyrmyshova, babies get a virtual toe hug from the world's cuddliest animal. Clean with damp cloth, air dry. super cute sloth for my little niece. Never been this disappointed with an online purchase. Think I will post it on one of those sites that show really terrible quality purchases. You should be ashamed to sell something like this! Commongoods asks for too my info for reviews.